How Far is Prime Gardenia? Prime Gardenia is one of the residential Project located in Nizampet Road, Bachupally, Hyderabad. 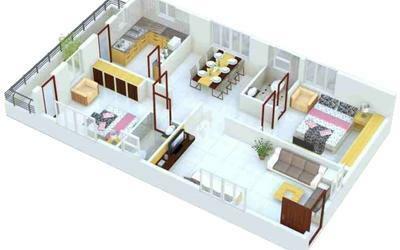 It offers spacious and skilfully designed 2 BHK & 3 BHK villas. The project is well equipped with all the basic amenities to facilitate the needs of the residents. First class brick walls in cement mortar. Plastering of ceiling and walls in C.M with smooth luppam finishing. Best teak wood frame with teak wood shutters (Polish quality). Medium teak wood frame with designed flush shutters. UPVC/Aluminium powder coated window systems with opaque glass and safety grills. Vitrified tiles in hall, dining, bedrooms and kitchen ceramic tile flooring in toilets and balconies. Black granite cooking platform with stainless steel sink and 3' height ceramic/glazed tiles dado. Glazed tiles dado upto 6' height. All fixtures in white colour of hindware/parryware or equivalent make. All CP fittings of plumber / ESS ESS or equivalent make. Each toilets will have one wash basin, EWC / WC, shower point and provision for exhaust fan and Geyser point. Concealed copper wiring in PVC conduits with modular switches. Adequate points like fan point, T.V & telephone points and 15A/5A power plugs. Bore- well and provision Municipal water from overhead tank. Internal walls and ceiling with plastic emulsion paint. External walls with exterior emulsion paint. Doors & windows with enamel paint (2 coats). 2 Six passenger capacity lifts. The PRIME Group, over the last many years, has built an impeccable track record in Hyderabad’s constructions landscape. The projects bear their signature is terms of architecture, facilities, finish and location. Started in 1995 by a dedicated team of professionals, the PRIME Group has completed close to 40 projects totalling to approximately 6 million sft of constructed area. The PRIME Group has successfully completed diverse projects like apartments, villas, layouts and commercial projects as well. The company has expertise of handling multiple projects at a time covering multiple acres of land. Along with Hyderabad, The PRIME Group has successfully completed real estate project in Vizag as well. Apart from Real Estate and Construction, The PRIME Group has interests in manufacturing industry as well. The group is successfully running an Autoclaved Aerated Concrete (AAC) Block manufacturing facility near Vijayawada.